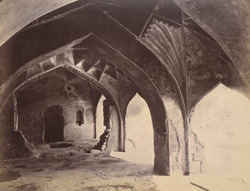 Photograph of a Water Pavilion at Kumatgi near Bijapur from the Archaeological Survey of India Collections taken by Henry Cousens in the 1880s. Kumatgi, 16 km east of Bijapur was a pleasure resort with a number of pavilions, tanks and cisterns overlooking a large lake. One of the buildings contains some important wall paintings including scenes of hunting, European envoys to the court of Bijapur and a polo scene. Around these pavilions there are elaborate waterworks and sparkling fountains which made this place a favourite of the Bijapur sovereigns during the dry season. This is a view looking along the vaulted interior.